Cold Feet star Robert Bathurst plays Sir Mark Thatcher in Coup! Sir Mark Thatcher's role in last year's attempted coup in Equatorial Guinea will be explored in a BBC Two drama. Written by satirist John Fortune, Coup! 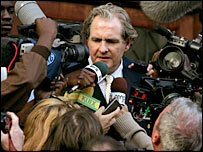 stars Cold Feet actor Robert Bathurst as Sir Mark and forms part of BBC Two's winter and spring schedule for 2006. An adaptation of Alan Hollinghurst's 2004 Booker Prize-winning novel The Line of Beauty will also be screened. BBC Two will also show Pinochet In Surrey, starring Derek Jacobi as the ex-Chilean dictator. Coup! also stars Jared Harris, son of the late respected actor Richard Harris, as Simon Mann, the former Army officer jailed in a Zimbabwe prison for his part in the attempted coup. Sir Mark denied any involvement in the attempted coup, telling a South African court he unknowingly helped to finance it. He was given four-year suspended sentence in January. Producer Alex Holmes said: "I don't think that he'll be happy about the film as it brings the story up again." Other new BBC Two dramas include Shoot the Messenger by Babyfather writer Sharon Foster, the mystery Soundproof and Shiny Shiny Bright New Hole in My Heart starring Daniela Nardini. BBC Two controller Roly Keating said: "I'm pleased that we'll be launching the new year with some really bold drama in the heart of the schedule." A new series of Who Do You Think You Are? 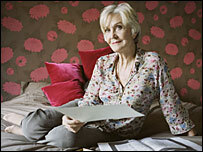 will follow actresses Sheila Hancock and Jane Horrocks, actor Stephen Fry, comic Julian Clary and TV presenter Jeremy Paxman as they trace their family trees. Sheila Hancock traces her history in Who Do You Think You Are? During the programme Paxman discovers that his great, great, great grandmother was a charlady living in poverty in Glasgow, who died of tuberculosis and exhaustion. Newsnight presenter Paxman, who has a reputation as a tough cynic, is seen sobbing into his hands while looking at her death certificate. "Hundreds and thousands of people must have lived like this and died like this," he says. "When it's just numbers it doesn't mean anything. But it means something when I'm connected to them." Facing the Truth will see Archbishop Desmond Tutu host six face-to-face encounters between victims and perpetrators in the Northern Ireland conflict. Reality series The Apprentice will return for a second series, with businessman Sir Alan Sugar putting 14 young high-fliers through their paces. Hit wildlife show Springwatch will return with presenter Bill Oddie and The Convent - a female version of reality series The Monastery - will follow four women as they live with nuns. The past 50 years of popular culture will be examined in Light Entertainment and the second series of cult Australian comedy Kath and Kim will be shown. BBC Two will also broadcast the Winter Olympics from Turin.